Coral System 1-4: vital elements and compounds for coloration,health and improved biology. 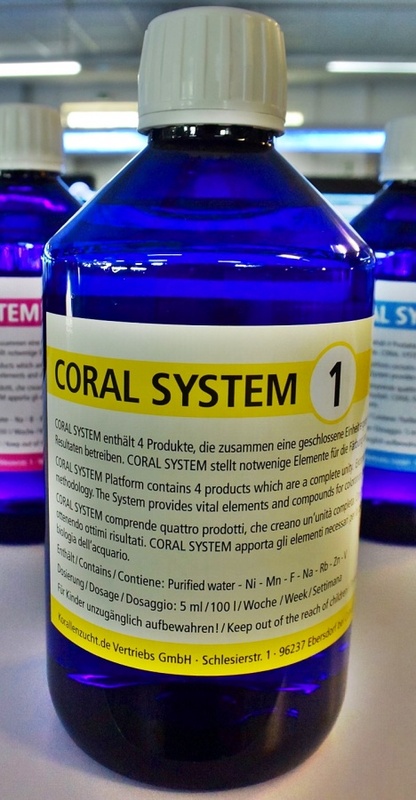 Coral System is a separate product line to cultivate and breed corals successfully, to maintain and enhance coloration with good growth rates and beautiful polyp expansion. This product line has been developed for reefers who want to cover most necessary additions with a complete system. An automized dosage with dosing pumps is possible without any problems. Coral System platform contains 4 products, which are a complete unity. Exceptional results can be achieved utilizing the Coral System methodology. The System provides vital elements and compounds for coloration,health and improved biology. It contains no calcium, carbonate, magnesium, these main elements have to be checked regularly and dosed separately when needed. Contains: Purified Water – Ni - Mn - F - Na - Rb - Zn - V.